How can environmental perception and habitat requirements of flagship species be integrated into 3-dimensional models to identify future habitats as well as migration pathways? This includes future dynamics of cultural landscapes due to climate warming and land-use changes. How to apply scenario-based participation processes for developing action plans in order to avoid conflicts among flagship species? 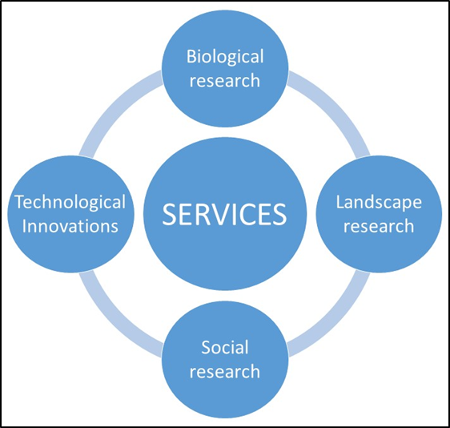 The figure above shows the interdisciplinary design of SERVICES including basic biological research, landscape as well as social sciences. Basic biological research approaches will be combined with 3-dimensional modelling techniques to visualize the results in landscape scenarios. At the same time, social science is taken into account with respect to strengthen participation- and agenda processes. Based on the interplay of scientific and technological expertise, an innovative landscape modelling will support the participatory planning process.